With deep joy and gratitude I hope each and every one of you has a holy and blessed Christmas!! During Advent it’s been my prayer that each of you would find time to reflect on your own faith and relationship with our Lord. Whatever it is that our hearts desire, whether we realize it or not, our ultimate desire is Jesus himself, and our hope has been fulfilled in the birth of the baby Jesus. As we think about the gifts we give and receive during Christmas, we’re reminded that Jesus offers the greatest gift of all – salvation. Christmas has a way of bringing individuals and families to church who, for various reasons, have not been to Mass or the Sacraments for months or years. What a wonderful and grace-filled opportunity to put aside old habits and start a prayerful relationship with our Lord. I extend to all of you a heartfelt welcome!! Together, may we grow in grace and celebrate together God’s presence in our lives!! May our Lord Jesus Christ, born in Bethlehem, bless you, your families, and your loved ones this Christmas and throughout the New Year. May Mary, the Mother of Jesus and our Mother, watch over you always. I’m going to take some time off after Christmas so I’ll be leaving you in the very capable hands of Fr. Niby – he loves it when he gets to be the boss!!! I’ll be back on Tuesday, January 3. The parish office will also be closed from December 22 – January 3. The weekend after Christmas is the Feast of Mary, the Mother of God – typically a holy day of obligation. Since it falls on a Sunday this year, our Mass times will be our normal weekend schedule: Saturday 4 & 5:30pm, Sunday 8:30, 10 & 11:30am. There’s nothing as exciting and mysterious in this world as when God creates life inside of a mother. Nothing brings joy to a mother and father like the birth of a child!! On January 1st at the end of the 11:30am Mass, we’ll be having a special blessing for expectant mothers and their unborn children. Because of the holiday season, bulletin articles need to be submitted early – so I’m writing this article before the Bengals play the Steelers. I’m still hoping for a Christmas miracle – the Bengals making the playoffs!!! J Although by the time you read this, they may be mathematically eliminated. My all-time favorite Christmas television show is Rudolph the Red-Nosed Reindeer. 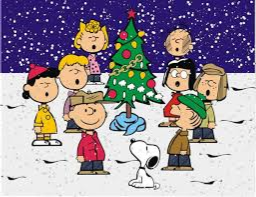 2nd is A Charlie Brown Christmas. Your 2 favorites?? My top 5 favorite Christmas songs: 1) Father Christmas – The Kinks, 2) I Believe in Father Christmas – Greg Lake, 3) The Little Drummer Boy – Perry Como, 4) Adeste Fideles – Bing Crosby, 5) Do They Know It’s Christmas? – Band Aid Yours? ?